Several days later, I had one of those "aha" moments. The toothpaste and the candy wax lips I favored as a child tasted similar. Warm memories of my aunt's tiny grocery store came flooding back. 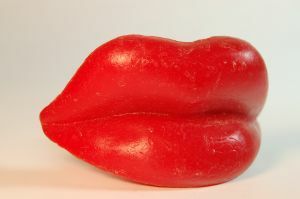 I saw my five-year-old self standing in front of the large candy case, selecting red wax lips. They never retained their shape long because I couldn't resist the cinnamon taste coupled with the smooth texture. I've read descriptions of various taste sensations in novels. Some of them were ho-hum, while others sent me scurrying to the kitchen or the grocery store. When writing about this sense, I try to incorporate details of sight and smell, as well as taste. I reach back into my memory bank and re-experience walking into a kitchen where cookies are baking or a Thanksgiving turkey roasts in the oven. Writers: How do you communicate the sense of taste in your writing? Readers: Do you recall any specific instances where a taste description made you hungry? Please share. Susan, That certainly was a trip down Memory Lane. When I was ten I was in charge of the candy counter at our little neighborhood store, and I got paid in candy. Wax lips were my favorite. my site is Write from the Heart. I can remember those red lips too. I have to be honest - I'm not sure I've ever thought about writing about a sense of taste - I usually think about describing the sense of feeling. Great idea. Thanks. Using the senses helps engage the reader. They can identify with the tartness of a lemon and other taste sensations. I remember wax lips! My sister and I used to get them whenever we could. :) Good question, and one I need to give some serious thought to. Sometimes certain foods make me pucker, or tingles the tongue, if I'm writing about those I'll have my character experience those sensations, but otherwise it generally comes out HO-HUM, as you say. Oh wow. Wax lip flavored toothpaste. How wild! I don't have much call for describing taste in my nf stories, but as a reader, I love Jan Karon's description of the orange marmalade cake. That makes the sides of my tongue tingle! You made me think of those wax lips and try to remember that taste. I did! I am new to adding lots of senses in my work--it takes work! I wonder why they stopped selling them. Maybe it was the red dye. Oh, I'm a serious cookie hound. Get characters baking, and I'm ready to get out the milk and chocolate chip cookies. Taste is a hard sense to convey. I suppose it takes practice like anything else. I remember seeing the waxed lips at the corner store's candy counter. I can't getting them. But I do remember getting the wax coke bottles full of syrup. They were very sweet. Just reading about the lips makes me want some. Cinammon, yum. One of my recent critiques was to add more visceral details and taste descriptions in my writing, so I'm working on that now. I remember those wax lips, too, but unlike you I didn't like chewing them. I think the sense of taste is closely related to the sense of smell. Sometimes, just writing how food smells evokes the sense of taste. Your posts are always interesting, Susan. I'm with Eileen. Cookie descriptions send me wanting cookies. What a funny post! Communicating taste can be tricky. As a writer I love to write aobut food. So to communicate taste effectively I always write about food I know and love. that way I can describe it authentically. I admire fiction writers who can actually make me hungry or paint a picture in my head that makes me want to be there. I remember those lips. I don't remember much of a flavor, though. Just the fun of chewing on that paraffin. Now all of a sudden, I remember Blackjack gum. I call myself the Cookie Monster. Love 'em! Getting good sensory description takes a lot of practice. I try to note how authors accomplish this in their books. I remember the coke bottles too. Remember the candy buttons on the paper and the candy necklaces? I also loved chocolate licorice. Actually, I think some places still sell the old candy. We could probably find it online. One of Tamara Leigh's books talked so much about a gourmet Jelly Bean that I started wanting them. When an author can achieve that reaction, it's a good idea to study their methods. Now, there's a writing prompt. Describe something you love to eat and something you loathe. 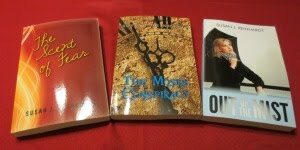 Who says you have to be a fiction writer? You can use fiction techniques in non-fiction. You're wonderful at describing the antics of your crew. Isn't it funny how talking about all these old favorites stirred our taste/smell/touch memories? There's a restaurant in town that smells like my grandmother's house: wonderful. I still miss her, especially when scent takes me back to the years spent in her house. She brewed strong coffee, smoked Kent cigarettes, and wore Este Lauder's Youth Dew.